Our first test was done using the LEDs on the relay board only instead of the actual water simulation. The graph below shows how the Arduino codes control our relay and as the pump will be connected to the relay, how it controls the pumps as well. So, pump 1 will be connected to Relay 1, which is linked to LED 1 thus, when LED 1 lights up, Pump 1 should work. Pump 2 is linked to LED 2 and should work the same way. The total amount of water to be transferred is 10.44 litres and we need to transfer that in 3.75 minutes. Thus, according to the pumps’ flow rate of 55.556ml/s and the fact that we need to get a close sine curve, we calculated the Relay timings. The LED stops for 4.625 secs at every interval so we are able to get a sine curve. When the LEDs pause, the pumps do not work. This test was done to check if the relay works properly. These tables show how the LEDs lit up in a time frame. In each cycle, the LEDs lights up for 10s, 12.5s, 15s, 17.5s, 20s, 18.96s, 18.96s, 20s, 17.5s, 15s, 12.5s and finally 10s. There is a span of 3.09s between each operation when the LEDs do not light up. The relay was not connected to the pumps yet, rather the LEDs only. This needed to be done too as problems might be faced while making the connection, perhaps in the wiring or the codes. Test 2 was conducted in the tank this time. 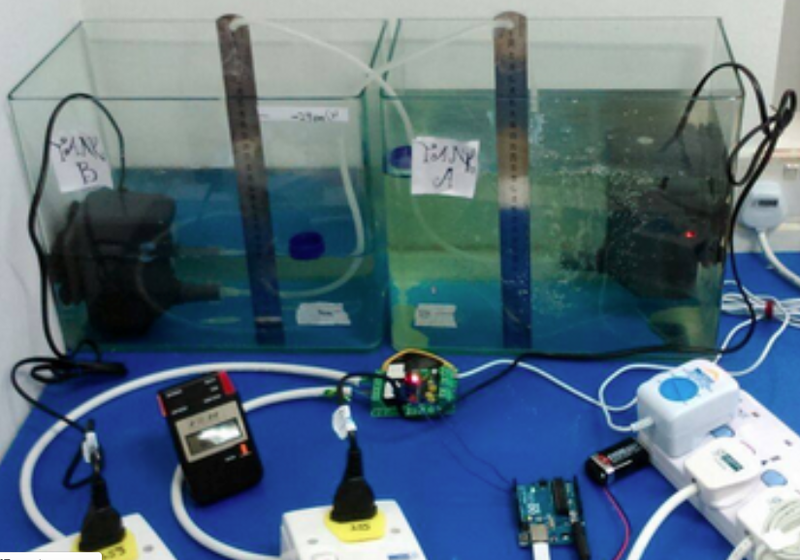 Using the pump flow rate of 55.556ml/s, we edited the codes so the water level in the tank would rise and fall in accordance to the tides desired. Upon marking the water level in the tanks at intervals, we can construct a table which would then be used to generate a graph to show how the water level increases and decreases. When pump 1 is working, water is transferred into Tank A, thus the water level increases and when Pump 2 is working, water is transferred out of Tank A, thus the water level decreases. The pause time was increased as a shorter span might have caused the pump to spoil. The graph generated only has a close resemblance to a sine curve as the pump only flows with a linear rate and a perfect sine curve cannot be generated, thus the codes are needed to control the pump to simulate a sine curve. The cycle of each pump begins with a low (pump is off) and ends with a low too. This has to be changed to the starting with a low and ending with a high. The linear part of the curve is constructed at too far apart intervals. Thus, when the graph is continued beyond one sine curve, it no longer resembles a sine curve as it is not symmetrical. So, we would need to increase the number of pauses to allow shorter intervals in the linear part to allow the graph to further resemble a sine curve. With the codes edited, each pause lasts for merely 3.09s. The graph shows how the codes now generate a curve that better resembles a sine graph. When the test was conducted, the water level did not rise in accordance to the graph. Upon scrutinizing the system, we realized that the pump flow rate is actually lesser than that mentioned on the box. So, we had to first find out the actual pump flow rate, which turned out to be 5.556ml/s. Thus, we had to buy a stronger pump and do the coding again. The new pump’s stated flow rate is 1800l/h. However, after calculating, we found out that the actual pump rate is 24.22ml/s. Thus, we redid the coding in accordance to the new flow rate and increased the amount of time for the simulation. After doing this test, while dismantling the pump connections with the pipe, one of the pieces broke, thus, we had to make adjustments which again would lead to a change in the pump flow rate. After making adjustments to the pipe connections, we assessed the pump flow rate again and found it to be 31.14ml/s. Therefore, for the highest amplitude to the lowest amplitude of the sine curve, we will pump a total of 350 secs, excluding the pause time. And the achieved time must be 2250 secs. As the pump pauses 18 times, each time, the pause will be 105.56s. The grey curve, which has a very low visibility proves that the curve of water level change very closely resembles a sine curve.